Laolu Akande, Abuja: Vice President Yemi Osinbajo, SAN, has urged financial institutions to uphold a high level of integrity and forthrightness in the discharge of their duties. Prof. Osinbajo made this remark when a delegation from the Association of National Accountants of Nigeria (ANAN) paid a courtesy call on him at the Presidential Villa in Abuja. 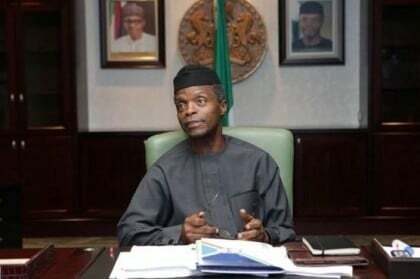 Osinbajo said financial institutions have a crucial role to play in helping the President Muhammadu Buhari administration to fight corruption, as well as in improving the country’s economy. He added that, as a financial body, ANAN should call out individuals who are allegedly tied to some levels of financial crimes to step down from their positions, so as to help curb corruption in the financial sector. “The level of integrity that we expect is not necessarily what we are seeing, especially in respect to financial statements and all of that,” the Vice President said. He also commended the association for the important roles it has played in regulating the country’s financial sector since it was incorporated in 1979, adding that a high level of integrity by financial institutions would help improve the lives of citizens. Earlier, the ANAN delegation, led by its president, Alhaji Shehu Usman, praised the Buhari administration for its leadership in the affairs of the nation, the fight against corruption, insecurity and improving the economy. The delegation appealed to the Federal Government on issues bothering on appointments of their members into key positions in the civil service.